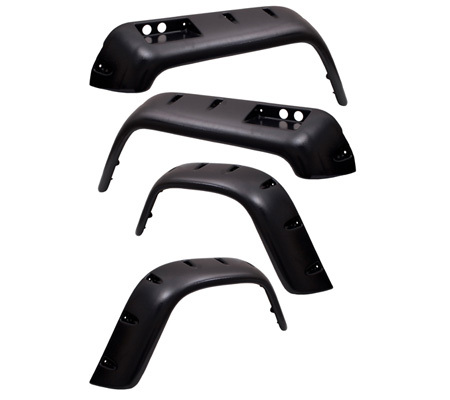 The new All Terrain Flat Fender Flares from Rugged Ridge allow to run larger tires without lifting the vehicle or cutting the body, so you can add a bigger tire option for that true off-road look. The ability to run a larger tire with little or no suspension lift means a “lower center of gravity” making your JK more stable, yet still gives you the ground clearance you need to head off-road. With 1.5" less coverage in the front and 1" less in the rear these flares are slightly narrower than factory, yet still maintain proper tire coverage and aggressive looks. Constructed of a flexible UV treated high impact thermoplastic, these flares are made for the trails. The flares attach to factory mounting locations and no drilling or cutting is required. The kit also includes easy to install brackets that relocate the factory side marker lights.